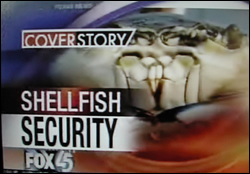 The chitosan nanosensor story finds new legs as Baltimore's FOX 45 gives it the in-depth "cover story" treatment. Chitosan, a substance found in crab shells, is the key component in a nanoscale sensor system developed by Associate Professor Reza Ghodssi (ECE/ISR) and graduate students Nathan Siwak, Sephan Koev, Jonathan McGee and Mike Fan in the MEMS Sensors and Actuators Lab. The sensor can detect minute quantities of explosives, bioagents, chemicals, and other dangerous materials in air and water, potentially leading to security and safety innovations for airports, hospitals, and other public locations. View the video clip at FOX 45's web site in Windows Media Player or Real Player formats. Read ISR's original story here.